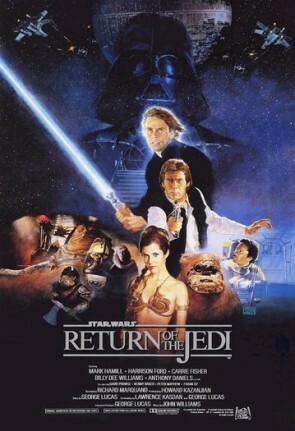 Star Wars Episode VI: Return of the Jedi is a 1983 space opera film directed by Richard Marquand and written by George Lucas and Lawrence Kasdan. It is the third film released in the Star Wars saga, and the sixth in terms of internal chronology. It is also the first film to use THX technology. The film is set some time after Star Wars Episode V: The Empire Strikes Back. Luke Skywalker and members of the Rebel Alliance travel to Tatooine to rescue their friend Han Solo from Jabba the Hutt. Meanwhile, the Galactic Empire is planning to crush the Rebel Alliance with a second Death Star while the Rebel fleet simultaneously prepares to launch a full-scale attack on this new space station. Luke confronts his father, Darth Vader, in a climactic duel before the evil Emperor Palpatine. The film was released in theaters on May 25, 1983, receiving mostly positive reviews. The film grossed over $775 million worldwide. Several home video and theatrical releases and revisions to the film followed over the next 20 years. It was the last Star Wars film released theatrically until Star Wars Episode I: The Phantom Menace began the prequel trilogy in 1999.